Bishada: The village head of Bishada village on Monday denied any conspiracy behind the lynching of Iqlakh by a mob and instead blamed rumours and photographs of carcasses circulated through social media for the incident. "Lately, we have witnessed rumours being spread by some miscreants who throw carcasses at certain places, including surroundings of temple premises at villages in and around Bishada, click photographs and then circulate the same through Whatsapp and social media," said Sanjeev Rana, village head of Bishada village. "These photographs are followed by rumours circulated through the same networks," Rana, said adding that the matter was reported to the district magistrate and he was asked to take immediate action. 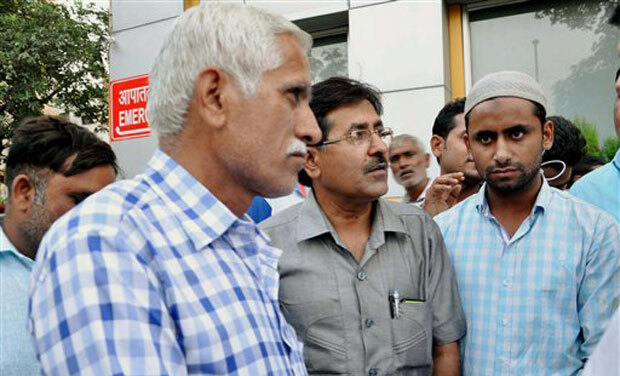 A similar rumour, based on photographs of carcasses, spread in the night in which Iqhlaq was lynched to death and his son, Danish (22), was severely injured at Bishada village in Dadri, said Rana. "The young blood (youth) in the village were influenced by the message, which later led to the violence. However, the young blood just wanted to teach a lesson to Iqhlaq's family. Killing him was out of question," he said. "Bishada has always had a temple and a mosque and both communities have lived here in harmony for decades. There is no larger conspiracy or plan (yojana) behind the incident," Rana added. Agitated villagers, comprising mostly women, resisted entry of media personnel in the village today, claiming that they were infuriated by the way the media covered the entire incident.